The castle is open all year round (April to September 09:00 to 19:00, October to March 09:00 to 17:00 ) with an admission price of 200 Lek. 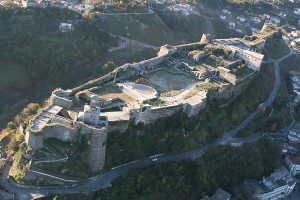 The castle has been the nucleus of Gjirokastra, with most of its population living within its walls until the Old Bazaar Quarter (Pazar i Vjetër) developed outside its northern gate in the 15th century. The first fortifications were probably built since the 5th century BC when Epirus was a battleground between Illyrians, Macedonians and Roman forces. A bigger fortress was erected by the Despotes of Epirus under Byzantine auspices in the 12th and 13th centuries.